I mentioned the other day we got the only full hookup site in the RV park. Luck was on our side for sure. I should have ran down to the corner store and bought a lottery ticket but I didn’t. However, that evening we didn’t feel so lucky when we saw a truckload of canoes and more vehicles pull into the park …. along with about 40 cub scouts. Oh oh ….. I began to wonder if we were going to be moving before our timeslot ran out. Even though they were running everywhere, they actually were fairly quiet and out of the park before we were even up the following morning. Whee ! We were afraid the troops had moved in. Friday was another beautiful day. It just doesn’t get better in this area than it has been. Temperatures are predicted to continue in the 80’s and plenty of sunshine is going to be around here for a while. We sure appreciated that sunshine and with such a clear day, we figured that would be the day to be on top of the world. So, that’s where we headed …. the top of the world. Port Angeles is just a short distance west from Sequim. It’s the biggest little town in this part of the Olympic Peninsula. What Port Angeles doesn’t have Sequim does. Well, that’s not quite true because neither town has a Fry’s Electronics which just happens to be about my favorite store. Plus, there is no Winco but there is a Costco! This deer was curious about Duchess. Of course, Duchess was used to deer so didn’t pay attention to her. Ms. Deer kept coming. Thus, we had to move. 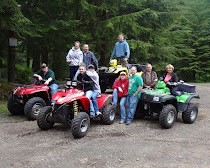 We were off to Hurricane Ridge. The road to Hurricane Ridge lifts you from sea level to just over 5000’ high above it. It’s about 15 miles from the town … up. The old-age pass or America the Beautiful pass gets you in for free. From there it’s up, up and up with many pull-over spots to take in the beauty of the area. There are three tunnels and lots of bicycles. I certainly can’t imagine biking up this 7%-ish grade -- or, even down it. The Visitor’s Center at Hurricane Ridge. Summer flowers, green trees, beautiful weather, snow and mountains. View of Port Angeles and even of Vancouver Island. Then, it was down, down, down. Since I’m a creature of habit, I always have to stop at the overlook just before we get into the town of Port Angeles --- always. On a clear day you can see forever. Well, you can see the town, ferries, Ediz Hook (aka The Spit) and even Victoria. The ferry to Victoria is big business to Port Angeles. You can take day trips as plenty of lots allow you to park while you do just that. We noticed this little camper pulling a big boat. What ? Next, was Ediz Hook. We spent many, many hours and days in this place. There used to be a big salmon derby here every year with very nice prizes --- boats, cars and money. The following week there was a junior salmon derby for kids. Of course, that’s when the salmon were plentiful. Plentiful fish is not the case like it used to be. That’s not to say there isn’t fish. There is. This is one of the places the big fishermen fish for salmon, ling cod and even have been known to pull a few halibuts out of this water. Dad used to know where all the holes were. Of course, he also fished along the Strait at Seiku and Pillar Point. Maybe we’ll make it there again sometime but not this year. Looking back towards Port Angeles from Ediz Hook. What next? Well, there certainly was a little more this day. What about the house my folks lived in when I was born? The little house looks run down for sure. There was a tall tree on the side my brother and I used to climb up and ride the branches down. We visited the house my folks moved to when I was about 9. And, the garage my dad built. I wonder if my fingerprints are still in the concrete. I’m no where near through visiting my past. We might just have a chance to check a couple more places off my list. My dad used to quote the “grass is always greener on the other side” because one doesn’t always appreciate where they are and what they have. I’m sure I never appreciated the beauty of this area when I lived here. I know I didn’t. I enjoy visiting this area but it also makes me sad. I miss all the people who have gone on before me. My family was important to me. I loved being with cousins, aunts, uncles and my immediate family. I think I just figured they’d always be a part of my life just like others figure we'll always be part of their life. Sad but the life cycle goes on. Your new camera is amazing. And how did you get them so wide without running into the margins? The secret is being someplace worth taking pictures of. Hurricane Ridge and Ediz Hook are gorgeous places. Sometimes I use tables and other times I just resize the picture by chopping the top or sides. Beautiful pictures Jeri! Hurricane Ridge is magnificent. What a treat to visit your old neighborhoods. I think getting older helps us to appreciate the people and things we took for granted when we were lots younger. Okay, you have done it again! Another location for my pinterest board. Love your photos. Gorgeous header photo. Good job Jeri! What an awesome photo day. The photos are super! That is such a lovely area. I can see why you visit as often as you do. Enjoy reminiscing. Memories are such a wonderful thing. When I was a child our family and community centered around a church. A few years ago I attended the ceremony to deconsecrate that church as it had been sold. The minister there couldn't understand all the grieving over a building. She didn't realize it was the community we were grieving. It used to be I could go back on a Sunday and be right at home once again but that community is gone now. Most of my friends and family have moved away so I just go visit Dad & Jean now. Love the photos. Is it the camera or the photographer that gets the credit. I think it's more Mother Nature. Anyone can take a good picture if they have something people to take a picture of. The ridge and the beach - what a beautiful place with so many wonderful colors! We love revisiting places where we were children and even where we lived while in college, first homes we ever bought, etc. Things rarely look the same, but then either do we :-))))). What a difference 2 months makes on Hurricane Ridge. In mid May there was still lots of snow everywhere. Guess I need to plan another trip over there for Sharon and I. More awesome pictures, and it is so nice to visit your past and enjoy some great memories. 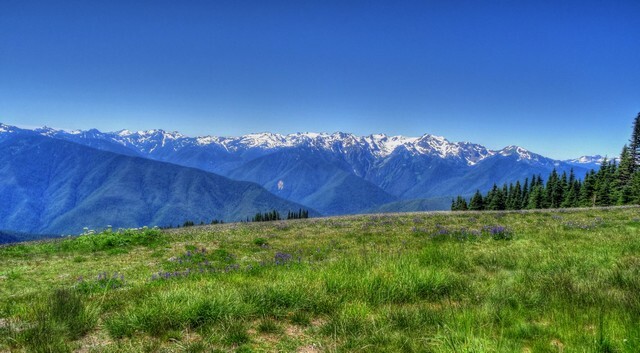 Great pictures of Hurricane Ridge! It definitely goes on the list. I was on the other side of the straits looking back at you from the Victoria side yesterday! I had my binoculars out and waved but didn't see that you waved back! Mason did.